Ben Nelson is an American politician, businessman, and lawyer. 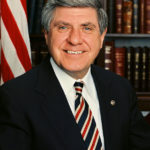 A member of the Democratic Party, he served as the 37th Governor of Nebraska from 1991 to 1999, and as a United States Senator from Nebraska from 2001 to 2013. Nelson was an insurance executive before he entered politics. His first run for office was in 1990, when he narrowly defeated incumbent Republican Governor Kay A. Orr. He was re-elected by a landslide in 1994. He ran for an open U.S. Senate seat in 1996, losing in an upset to Republican Chuck Hagel. He was elected to Nebraska’s other Senate seat in 2000 and was re-elected in 2006. He did not run for a third term in 2012 and left the Senate in 2013. "What does it mean to be an American? While each of us may have our own specific answer to that question, we likely can agree on the basic principles of America: freedom, equal opportunity, and rights accompanied by responsibilities." "Let me be clear. I support the definition of marriage as a union between a man and a woman." "We can take full comfort in realizing the continuing strength of our nation. America’s lands remain radiantly rich with diversity, and freedom still reigns." "For many Americans, including many who are employed, going to the doctor when they fall ill or become injured may not be an option because of the absence of health insurance."